D'Addario's first set for Chinese traditional instruments. The ERHU01 string set was designed to achieve a pure, bright, and focused tone sought after by professional Erhu players. To address the widespread need for professional quality accessories for Chinese traditional instruments, D’Addario has teamed up with performers and educators around the world. 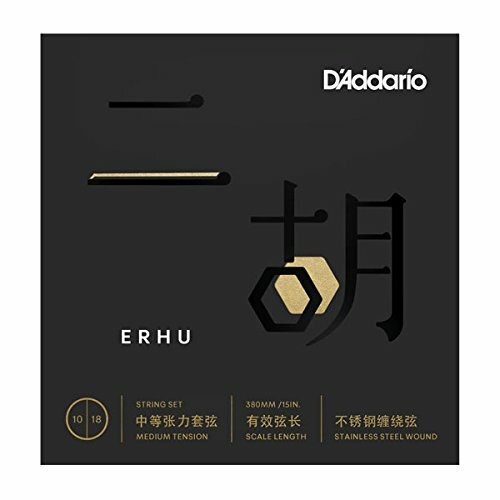 Pairing their expert musicianship and advice with our experience in string making, we have created instrument strings for Erhu, Pipa, and Ruan, with the exceptional tone and precision that D’Addario is known for. Made in New York using our advanced string manufacturing equipment, D’Addario strings for traditional Chinese instruments deliver a world-class musical experience. Silk wound at both ends to protect the instrument from wear and to extend the lifespan of the strings. Dual language packaging communicates the product features and benefits clearly to mainland Chinese and international consumers. Sealed inner packaging prevents corrosion during shipping and extended storage. View More In Orchestral Strings. If you have any questions about this product by D'Addario, contact us by completing and submitting the form below. If you are looking for a specif part number, please include it with your message.